Custom arts and crafts inspired deck. 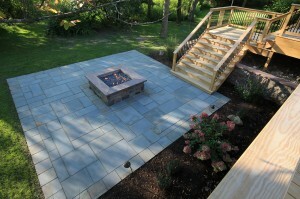 A bluestone patio surrounds the custom built granite gas fire pit. We designed and built this home’s custom deck and patio area, with views of the private golf course just past the tree line. An opening in the deck allows sunlight to cascade into the finished basement windows and landscaping below. The custom arts and crafts deck railings are inspired by the home’s aesthetics. 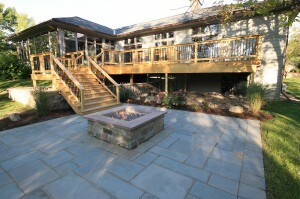 The bluestone patio surrounds the custom built granite gas fire pit, and is large enough for the homeowner to entertain family and guests.